To understand Agnes of God, a "psychological/supernatural thriller" from 1979, maybe it's helpful to look a little harder at the more ancient and epic battle it represents. On the surface, John Pielmeier's drama seems to be a psychobabble-laden tug-o-war between believers and a damaged, analytical mind fallen away from the church. Structured primarily as a series of arguments between a nun with secrets and a shrink with secrets, Agnes of God may not be about the innocent, simple-minded young sister who appears to have murdered an unwanted baby. Sure, that's the show's sensational hook, but this highly actable, if frequently problematic script, wants to grow into a full throated Platonic dialogue rehashing the 500-year-old grudge match between empirically verifiable "facts" and that which was once determined by the church to be "truth." Even with all the news about "fake news" we take the primacy of facts for granted these days, but all in all, they're a relatively new concept. As emerging sciences elevated empirical knowledge during the Renaissance the very idea of fact-based learning challenged and chipped away at the church's supreme authority. Progressive minds were often imprisoned or excommunicated or worse for subverting "truth" but little by little all absolutes buckled under the terrible weight of relativism and "facts" emerged as the frequently assaulted measure of everything that matters. To this end, Agnes of God seeds its struggle between faith and scientific inquiry with doubt, bias, and a great deal of manipulative woo-woo! A critic writing for The Chicago Reader once called it the "anti-Inherit the Wind," and while I might be a bit more charitable, the description's not so far off base that I'm not going to appropriate it. And like the American criminal court system, the script's apparent aim isn't to prove that divine miracles can happen, only to insert a gore-spattered habit's worth of reasonable doubt. More frustrating: As the play's ancient polemic reveals itself, the more apparent it becomes that Agnes, a helpless creature who's been raped by her author if by nobody else, has little meaning to either side of this debate outside of how she might serve self interest or self-preservation. To that end she's both the title character, and a walking, talking McGuffin. This makes it exceedingly difficult to like anybody in this play enough to care about who wins the fierce debate. It's pretty evident from the beginning that whether Agnes is declared competent to stand trial or not, it's certainly not going to be this doe-eyed and free-bleeding jumble of ignorance and anxiety who may or may not be a virgin mother and saint. What Agnes of God does that we can all be thankful for is provide three women with some extremely showy acting opportunities. New Moon Theatre's cast and crew delivers all the fireworks you could possibly hope for. 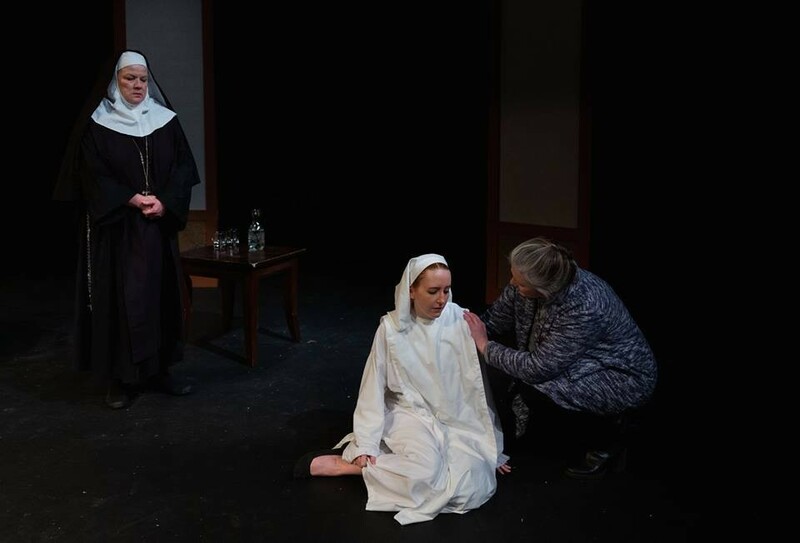 It's a remarkable convergence of talent with Kim Justis stepping into the part of Dr. Livingston, Susan Brindley as Mother Miriam, and Mariah Chase as Sister Agnes. Bringing these three strong performers together under the direction of Pamela Poletti, is a special occasion to be celebrated, even if the material's more sensational than satisfactory.